Start making money as a freelance writer today. Listed within are websites that pay you to write -- about anything you want. You can start on your journey to making $100/day as a freelance writer immediately -- and reach your goal within a few weeks. Really! 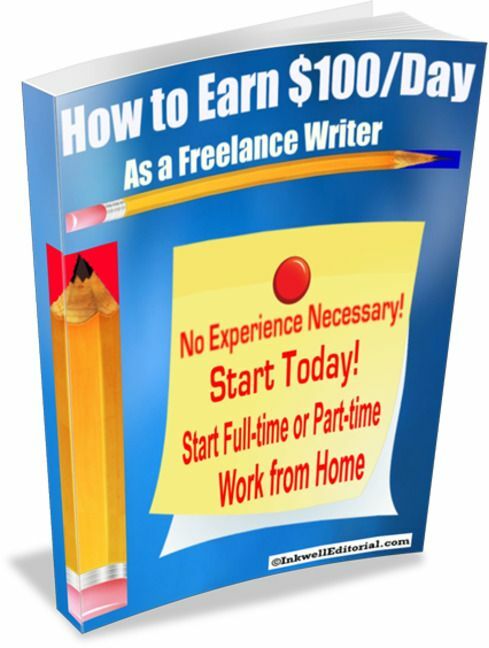 How to Make $100/Day as a Freelance Writer outlines four steps that show you exactly how to make at least $100/day as a freelance writer. I've been a freelance writer since 1993 and work from home, getting jobs via the internet every day. (i) It's really easy to make $100/day as a freelancer writer; or (ii) there are just a few who succeed as freelance writers. Of course, the first point is true. But, the freelance writing field is so vast, it can be overwhelming, making it difficult to actually bring in those first few dollars. And, that's why I wrote this little money-making report. $100/day is the least of what you should be making as a freelance writer. Following these four steps, you should be making $100/day as a freelancer writer within a few weeks -- really! Start Making Money as a Freelance Writer Today -- Really! Included are websites that pay for content. You can you can start making money as a freelance writer as soon as you finish reading this informative, concise report. Literally AS SOON AS you finish reading. If you have a computer and an internet connection, you can get started just that quickly. Length: Twenty (20) of the best pages of advice on freelance wriitng you will ever read from an expert who's been a freelance writer since 1993. P.S. : Want to start a successful freelance writing career, work from home and set your own rates? See all Inkwell Editorial Titles on e-Junkie.